I've been using OneNote for a few years in my classroom and dedicated one chapter in my latest book on how OneNote can make a difference in your classroom. By creating and sharing a document students can brainstorm. Rather than giving away the knowledge, your students discover and build knowledge together. I did research about collaborative learning and social constructivism and believe me: knowledge created by students has more value than knowlegde instructed by a teacher. Everybody will be able to participate, even the shy students. Each day 2 (different) students need to reflect about what they learned that day (interesting in primary education). The addin OneTastic offers a calendar which will summarize these submits. Sharing a document with parent will offer some kind of an interactive agenda. You can give feedback about the student's activity, inform about events, things to bring to school, etc. By adding tags and labels in papers and texts, you can bring additional structure. AND then you can automatically create a summary page by hitting Find Tags > Create Summary Page. I like to combine Office Lens to scan, straighten and digitalize paper document. 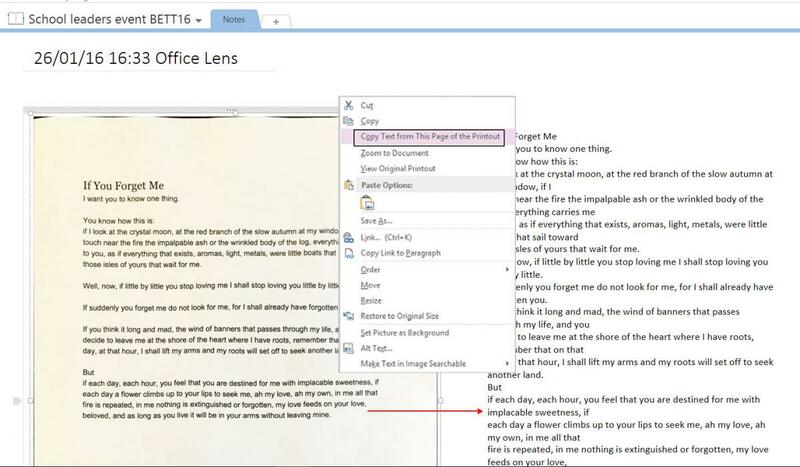 From Office Lens you can export to OneNote. In OneNote you can copy text from image and use Learning Tools. Yes indeed. Forget about Prezi and use OneNote instead of PowerPoint and Sway. By inserting images, writing text and sketching digital ink you can create presentations in a glimpse. Your audience will be able to participate, you can move freely through your audience and once you switch to full screen nobody will know that you are using OneNote. I create my textbook while I teach so my textbook is 100% up to date and to the point. My students are also allowed to create their own page. This results in a situation in which my students are also learning from each other and I'm even learning from my students since they add a lot of stuff I didn't know. It changes the class situation. Inevitably there will be a point in which the teacher has to admit he or she doesn't know. This drives the teacher outside his/her comfort zone but eventually will result in a better learning environment.